Festival Theatre utilizes a long standing Host Home Program, which matches Guest Artists with area Hosts for the duration of their time working at Festival. Guest Artists' stays range from 3 weeks to 7 months, and part time Hosts are needed for shorter term stays. The philanthropic support of our Hosts plays a crucial role in keeping alive the vision of our vibrant performing arts center. We are committed to bringing the best talent to the Valley from all over the nation, ensuring we can continue to provide the high standard of live entertainment that residents and visitors alike have come to expect from Festival Theatre. We truly cannot thank our Hosts enough for making our visiting artists feel at home in our community. 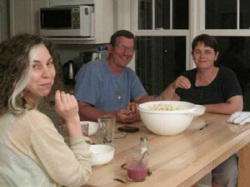 Host families become an integral part of a guest artist's experience by welcoming them into their home or property. In addition to helping ensure Festival can hire the best talent from all over the nation, because Festival Theatre is a 501(c)(3) organization, hosts may also wish to check with their tax advisor to determine if they are eligible for a tax deductible donation for hosting a guest artist.